Six countries – including Ireland – are not on track to cut emissions as required under EU law: the cost of compliance will be great. 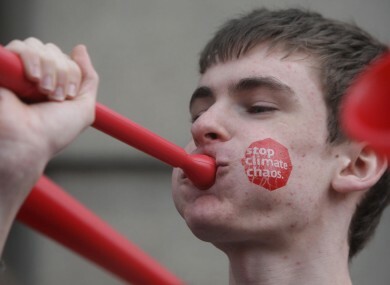 A member of protest group Stop Climate Chaos outside Leinster House in late 2011. IRELAND MAY HAVE to spend up to €300m over the next eight years to fulfill its obligations under an EU climate law because the country’s policies and plans are not strong enough to help it achieve the necessary reductions in greenhouse gas emissions. The government will have to buy millions of so-called “carbon credits” to offset each tonne of CO2 by which it exceeds its targets, the Environmental Protection Agency (EPA) has warned. Under a 2009 EU law, member states agreed to reduce greenhouse gas emissions from sectors including agriculture, transport, buildings and waste by 10 per cent on 2005 levels over the period 2013-2020. It is up to national governments to implement policies and measures to limit emissions from these sectors. Richer countries, measured in terms of GDP per capita, took on higher targets and Ireland is at the top of the table with an obligation to cut its emissions by 20 per cent over the period. Just two other countries, Denmark and Luxembourg, have a 20 per cent obligation. The targets were proposed by the European Commission in January 2008 and agreed by EU ministers in December that year, a few months after Ireland entered recession. Six countries including Ireland are not on track to make the required emissions reductions. The six will miss their targets even if all their existing and planned carbon mitigation policies are fully implemented, the European Environment Agency warned in October 2012. In a report published last month, the EPA confirmed that Ireland will miss its targets within five years. Buying carbon credits to cover the resulting shortfall will cost anywhere between €50m and €300m, depending on what further steps the country takes to cut its emissions in the relevant sectors. The cost of compliance may be even greater after 2020, the agency warned. Environment minister Phil Hogan published a draft climate bill last week, setting out some ways that the country may go about cutting its emissions. But the absence of any emissions targets from the bill was criticised by environmental groups including Friends of the Earth and An Taisce. EU countries have not yet agreed overall decarbonisation targets for beyond 2020 but the European Commission has proposed cutting emissions by 80 per cent on 1990 levels by 2050. The UK has already signed an 80 per cent target into law. Green groups had hoped to see such a target in the Irish bill too, arguing that it would act as an incentive to the current and to future governments to take action on reducing emissions. In its report, the EPA also recommended that Ireland adopt long term targets, arguing that these would provide businesses with the certainty to make low-carbon investments. Email “Shortfall in greenhouse gas emissions target may cost Ireland €300m”. Feedback on “Shortfall in greenhouse gas emissions target may cost Ireland €300m”.